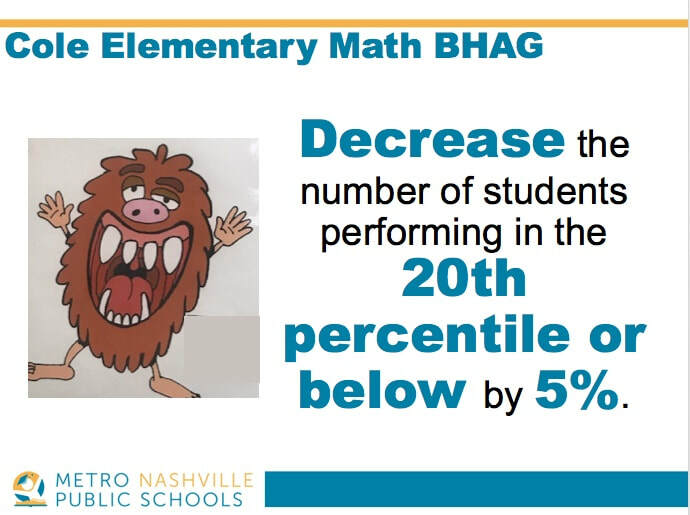 This year, Cole Elementary, has BHAGs (Big Hairy Audacious Goals) for literacy and math. 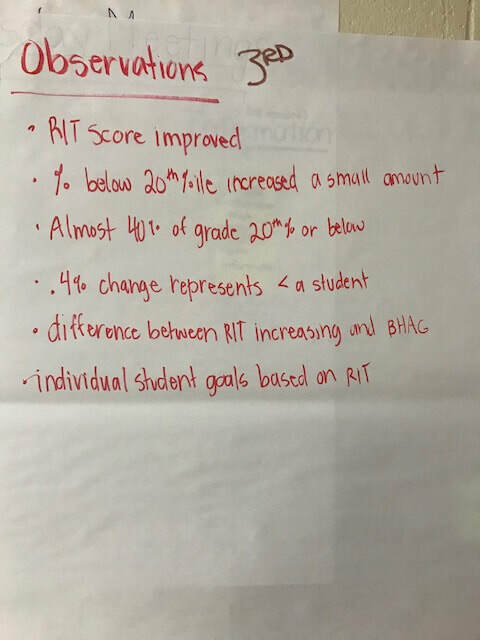 To create their math BHAG, the collaborative inquiry process was used during grade level team meetings. After the October 26th grade level team meetings, the leadership team met. They used the recommendations from the Oct. 16th meeting to establish a math BHAG for Cole Elementary. The outcome of this meeting, facilitated by Katherine Thrash, Cole's numeracy coach, and Denise Brown, Cole's data coach, was to develop grade level action plans for achieving the math BHAG. The math BHAG recommendations from the Oct. 26th meeting were categorized to look for themes. 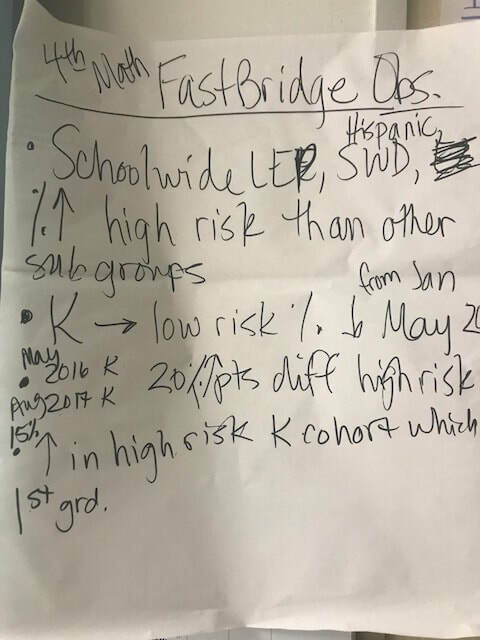 The leadership team used that data to inform the creation of Cole's schoolwide math BHAG. 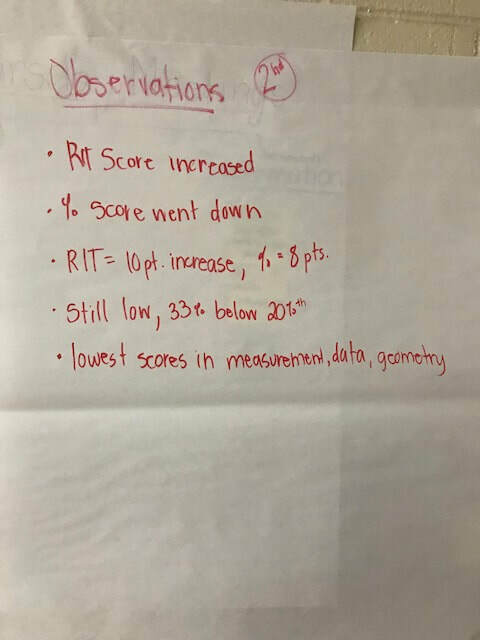 After the data observations, each grade level team established an action plan for achieving the 2017-2018 math BHAG. They will check in on these plans periodically to monitor their progress. can we spend time during the meeting creating tasks? On October 26, 2017, Dr. Margie Johnson facilitated the grade level team meetings where the collaborative inquiry process was used to leverage teacher expertise and voice in developing a school-wide BHAG. The session began with an activating and engaging activity called visual synectic. 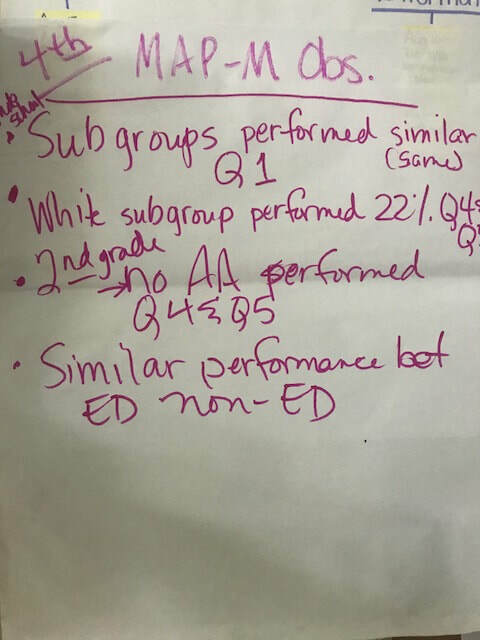 This strategy asks teachers to compare two things that seem to not have anything in common. 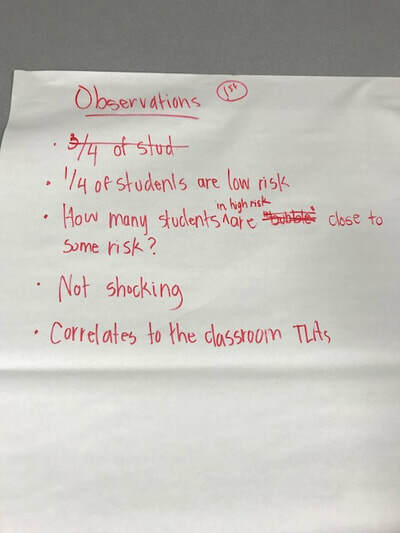 The premise of the activating and engaging part of the collaborative inquiry process is twofold--focus the conversation and establish psychological safety for deeper conversations. 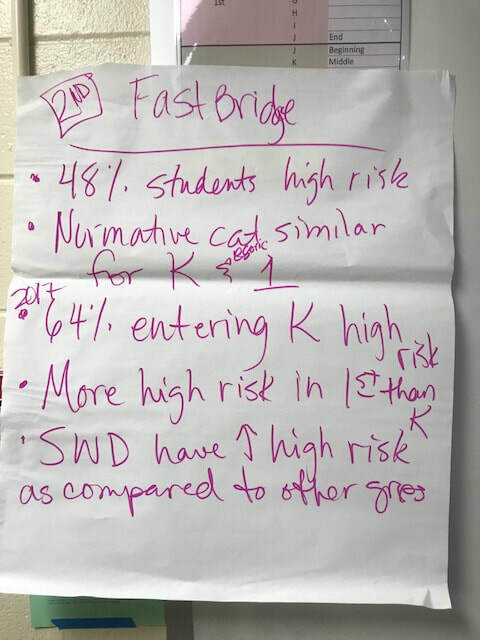 For Cole Elementary's data dive, we looked at grade level and school wide MAP and Fast Bridge data. After discussing the data observations, each person created a math BHAG recommendation to be reviewed by the leadership team in developing the school-wide math BHAG. 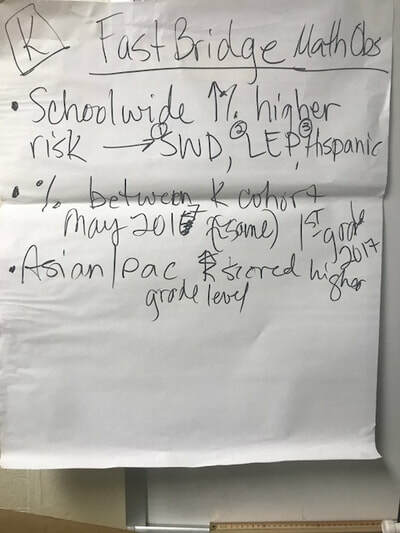 Check out their recommendations in the meeting minutes. 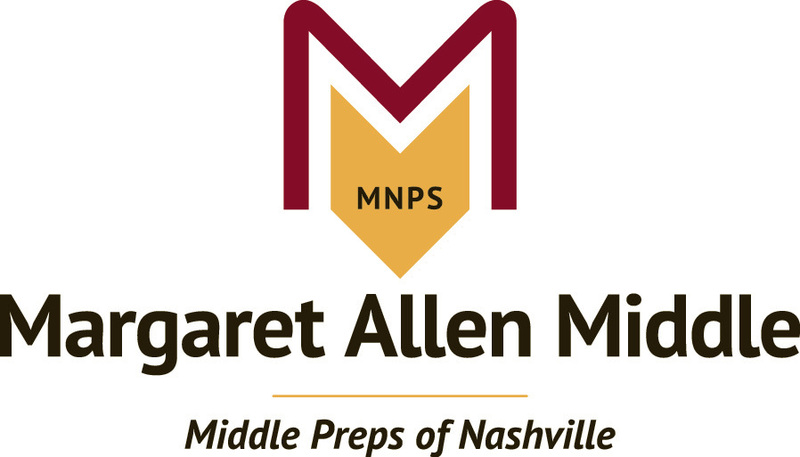 The leadership team will convene to establish a school-wide math BHAG. 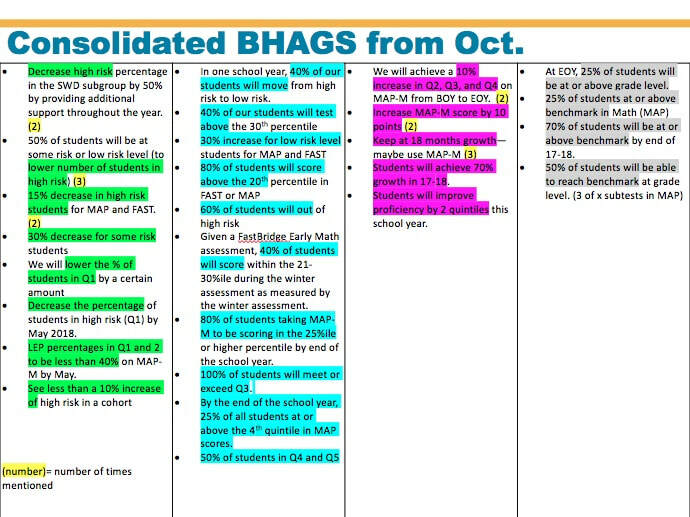 On Nov. 16, grade level teams will meet to develop action steps for achieving the math BHAG. What actions might you take as a result of our time together today? I will be more objective when looking at data. I will dig deeper and analyze my students’ math MAP goals and areas of weakness. 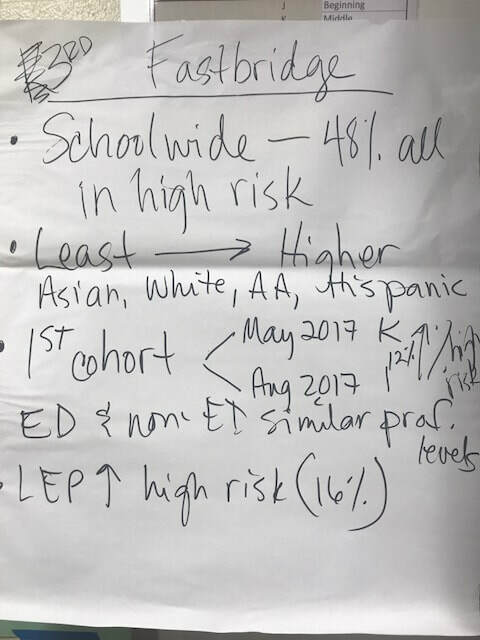 The majority of students are in the high risk category. More foundational skills need to be practiced. 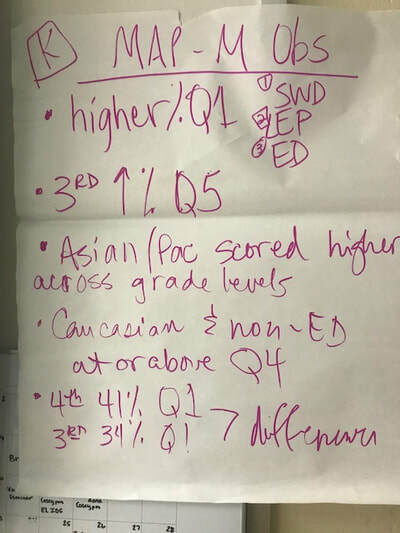 I did not realize Cole had such a large % of Q1 math scores across the board. 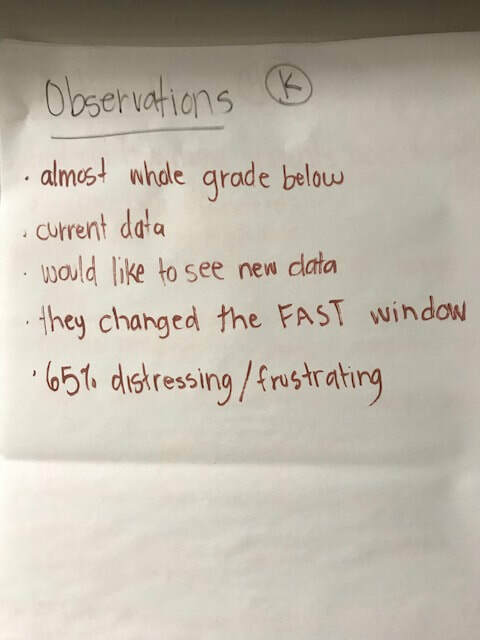 Taking a more observant and reflective mindset when looking at data. Knowing that data is not the end-all, be-all. 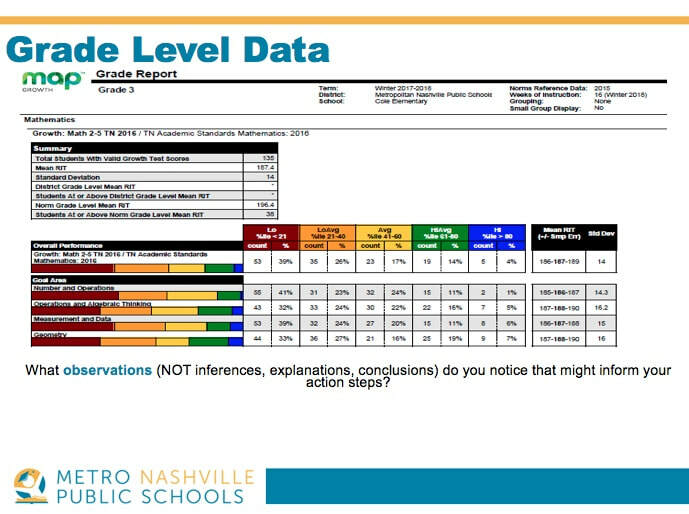 I will look at data and make observations rather than inferences. Where are the gaps? I will design lessons during guided reading that will target gap areas. 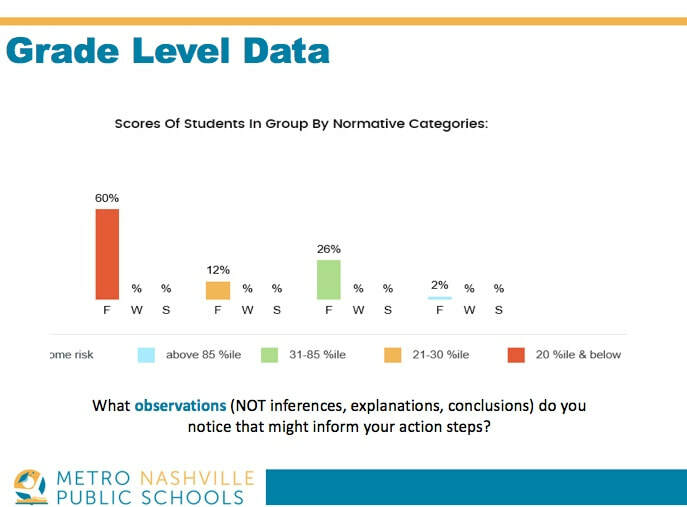 One reflection I would use as a take away would be to pay more attention to specific data. It was an excellent look at data from younger grades to see what the students need to work on once they get to upper grades. Who is in which subgroup? 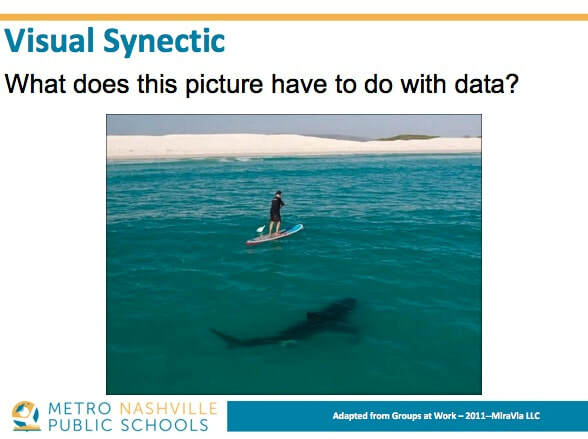 I thought it was vital and interesting to think about data without inferences. 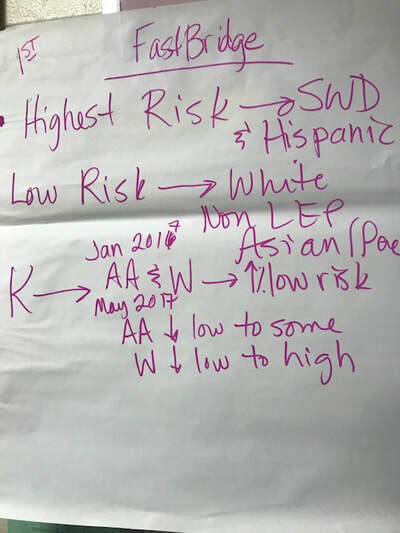 Look at the sections of MAP and see where the weaknesses and discrepancy lie. Data is important to use and understand for growth. 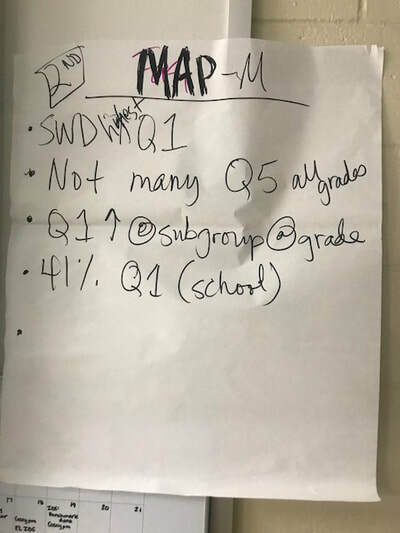 Look at the EL students for 4th grade MAP and especially for my small groups. 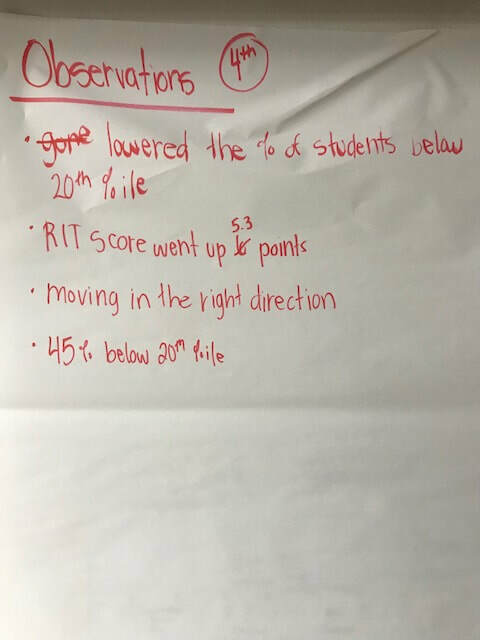 This meeting was able to show me a way of looking at data and use this data to create an achievable goal. To make a structured effort to reach African American children. We need to dig deeper into the data and see which areas were strengths and weaknesses from the assessment data. I liked looking at the data and feel like it was helpful. loved looking at data in a new way. Thank you! I love the attitude and the personality of the presenter. Thank you for being real with us. 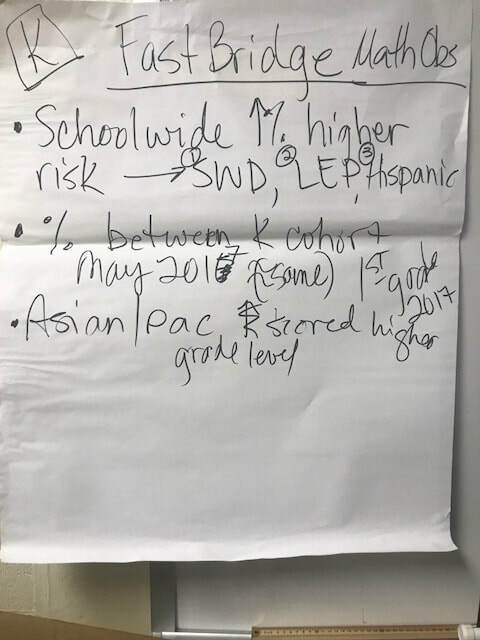 Data meeting was great. Appreciate that we were told we were the experts in our fields. Thank you. Collaborative inquiry process seems like a valuable process for our team. Thanks! I don’t feel like I had enough information to make a BHAG goal. I wanted to understand the whole school picture more. 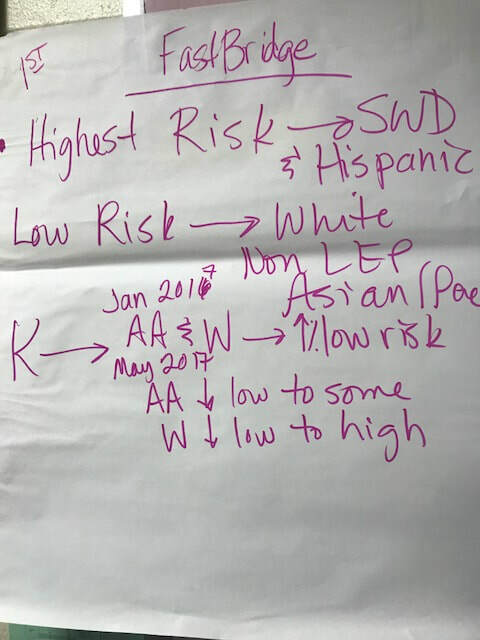 Why does data need to be divided by race? How could I use the data to know exactly what my students need to work on? 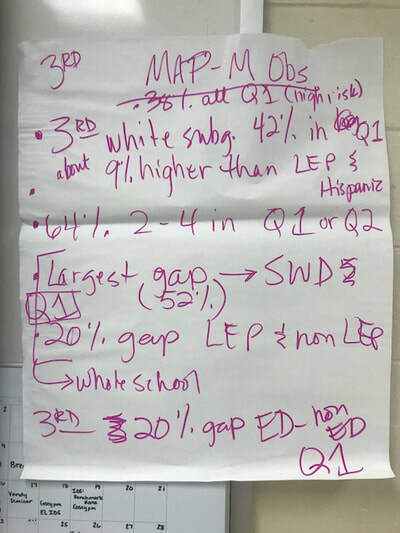 By breaking up the MAP and FAST data in groups, it was heard to understand what we were looking at and talking about.